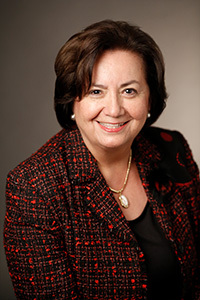 Maria G. Ott joined the USC Rossier School in October 2012 as Executive in Residence, teaching graduate level courses and participating in Rossier initiatives. Previously, Ott served more than seven years as Superintendent of the Rowland Unified School District, leading the district through major instructional improvement initiatives and modernization of facilities. She is nationally known for establishing partnerships with private foundations in support of Rowland Unified and its strategic plan and efforts to reach high levels of literacy and raise student achievement, placing Rowland Unified on the national stage and forefront of educational transformation movements. Prior to joining Rowland Unified, Ott served five years as the Senior Deputy Superintendent in the Los Angeles Unified School District (LAUSD), second in authority to Superintendent Roy Romer. She returned to LAUSD in 2000 after seven years as the Superintendent of the Little Lake City School District, serving the cities of Santa Fe Springs, Norwalk and southeastern Downey. Prior to her appointment as Superintendent of Little Lake, Maria Ott worked in LAUSD as a teacher, principal and central office administrator in the Office of Instruction. Her accomplishments included improving student achievement as a principal and national recognition for her leadership in improving educational outcomes and programs for English language learners. Her work on cultural proficiency is detailed in her book, A Culturally Proficient Society Begins in School: Leadership for Equity, with co-authors Carmella S. Franco and Darline P. Robles. Ott has presented to national audiences on the topic of her book and continues to contribute to the educational literature about the importance of cultural proficiency in closing achievement gaps.